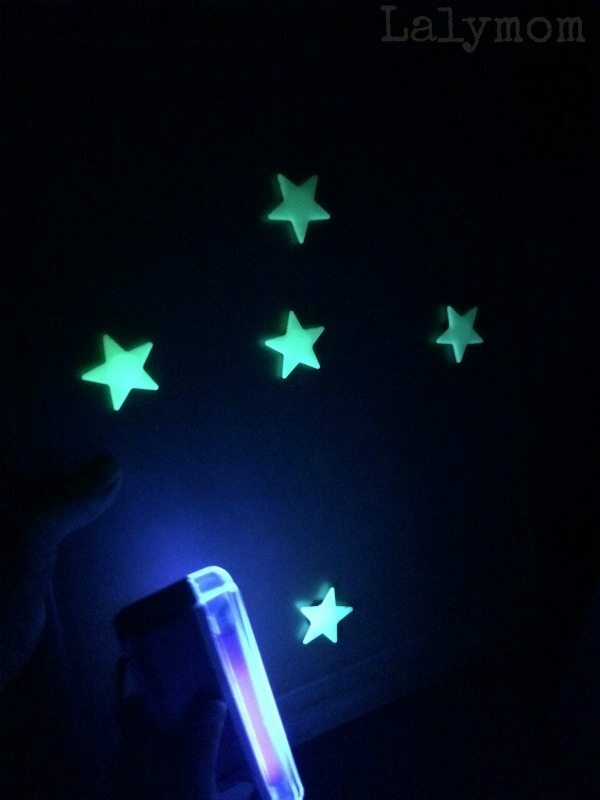 We recently have been playing with glow-in-the-dark stars and I was inspired to do an activity about constellations for kids. Our connecting star magnets could not have been easier to set up. Come check them out, I added some affiliate links to make it easy to whip up your own set! As a kid one of my favorite topics to study was astronomy so it has been really great to share that with my daughter now that she is old enough to be awake when the stars are out! We live in a big city though, so we can't always see a ton of stars. When we go to my parents' house or my in-laws' house we have much better luck. 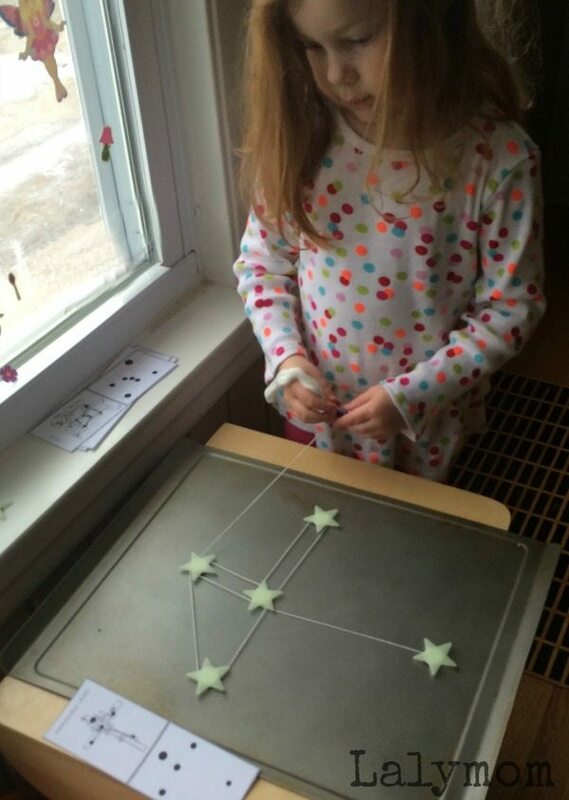 After our Glitter Stardust Writing tray the other day, these stars were sitting out from the container and I got to thinkin…..these would make such great learning tools! 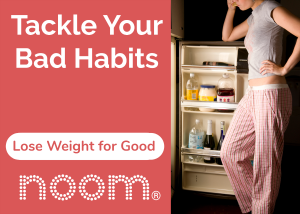 Of course the stars are intended to be stuck to your bedroom ceiling so you can go to bed beneath a blanket of glowing stars each night, which is also super cool. But I wanted to play around with them a bit instead! As it happens I had a bunch of my crafting supplies sitting out still from various projects. One of them was the package of adhesive magnets from our Melted Bead Magnets. It was meant to be! 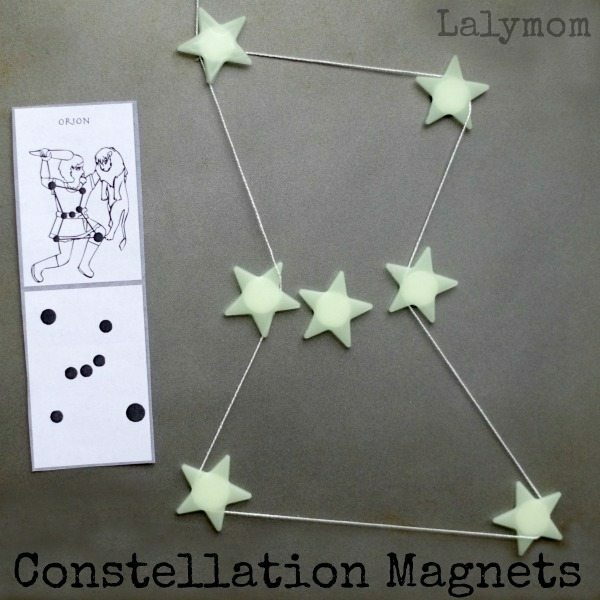 Constellation Magnets were born! 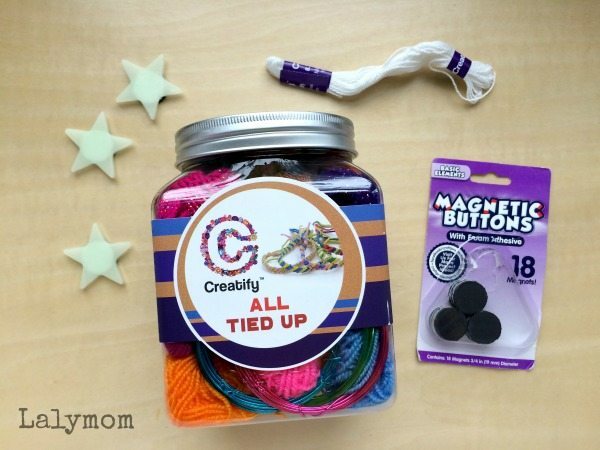 These pair perfectly with Teach Beside Me's Printable Constellation Cards, seen in the photos, or some super cool DIY Constellation Cards as seen on How Wee Learn. The other fun way to use these once you have made all sorts of connected constellations, is to whip out your black light (or just let them sit in front of a light for a long time) and take them into a dark room! Bonus: Since we have been celebrating Seuss week here, you could pair this activity with Dr. Seuss' There's No Place Like Space! Place the magnetic button adhesive side up on your counter, remove the paper backing and center the star onto the magnet. Repeat with as many stars as you want. Print or draw up your constellation cards and cut them out. Lay down your baking sheet and the cards, with the starts and embroidery floss next to it. 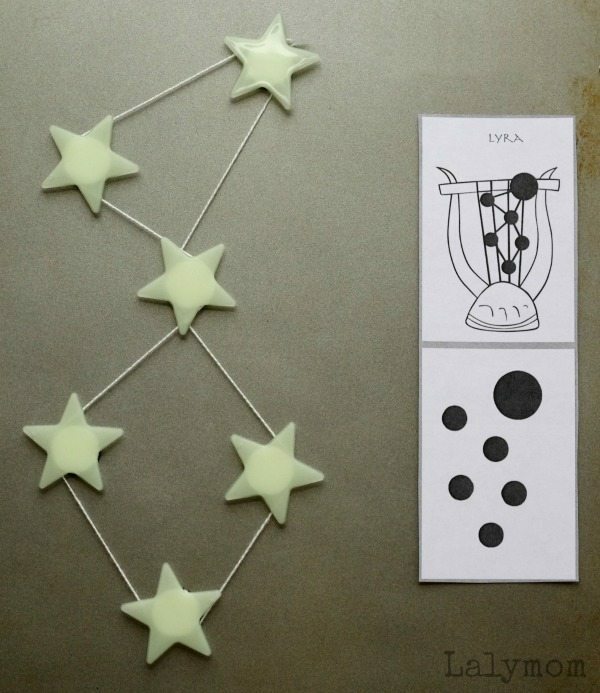 Show your child how to lay the stars out to match the cards. Then place the end of the floss under one magnet, held tight to the baking sheet by the magnet. Connect the stars but looping them around the various magnets. Voila! 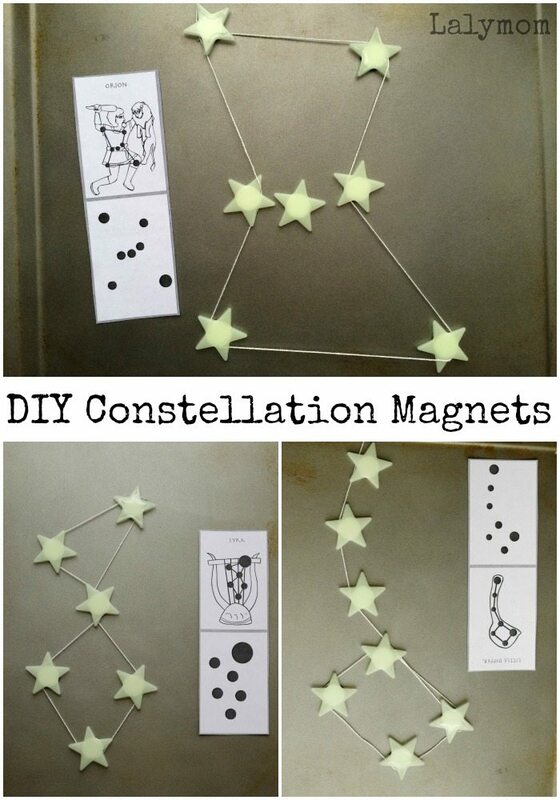 Constellation Magnets! If you like this idea, please do pin it! If you like doing fun, educational science activities with your child, check out my eBook, Pop, Fizz, Bang! 40 Playful Math and Science Activities and follow along on my Science Pinterest board! 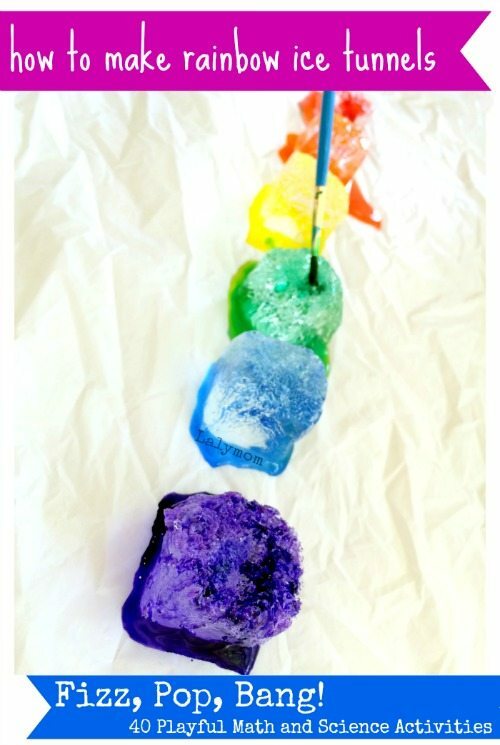 Follow Laura @ Lalymom Kids Crafts & Activities's board [Learning] Science on Pinterest.